Anyone without a hefty disposable income knows that travelling ain’t cheap. Getting from A to B, which seems like it should be so simple, can turn spontaneous adventures and even professional pursuits into massive expenses — and with public transport prices only continuing to increase, this is becoming a pretty financially exhausting world for today’s traveller. 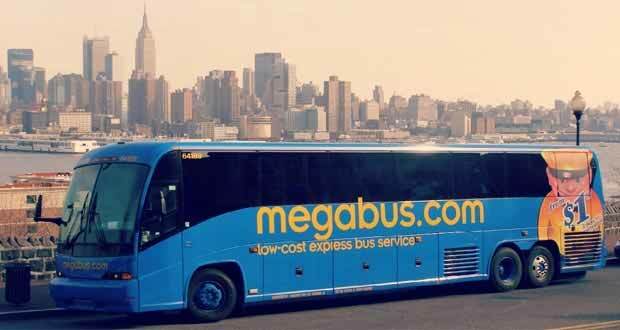 So, in these times of very costly commutes, all hail the Megabus. This 21st century solution to steep travel costs makes getting from one side of the country to another – or even journeying abroad – possible on a pocket change budget. With tasty travel deals to be had all year round, Megabus really is the saviour of cash-strapped travellers and commuters alike – and here are just some of the ways that Megabus shows the love. Need to make it somewhere mid-week? Lucky you – Megabus loves Wednesdays, which is why you won’t pay more than £5 to travel anywhere within England and Wales. Whether you’re tripping south to see the family or staying with friends for the week, booking your travel with Megabus makes your fiver go much further. Student life may be hard, and you don’t need to tell us that staying under budget is often an impossible task, but you’ll be pleased to hear that Megabus loves students too. Lucky NUS Extra Cardholders will get their already dirt cheap Megabus travel for even less, with a welcome 10% off all journeys. Sometimes it pays to be poor. Going abroad is a luxury many of us mistakenly assume we can’t afford. But while tripping to foreign countries and soaking up the culture is indeed an indulgence, that doesn’t mean it has to come with an indulgent price tag. Thanks to Megabus, anyone looking for a taste of Amsterdam’s delights or a weekend in gorgeous Cologne can find just that – from as little as £1.50. Northerners are brought up hearing horror stories about the terrifying cost of travelling to London – and unfortunately these aren’t just urban legends. Spanning Britain can be hugely expensive, especially if you’re travelling on impulse — but with lovely, lovely Megabus looking out for you, making your way down to the capital doesn’t have to be nearly so steep. How does £1.50 including booking sound? So whether you’re off to one of this summer’s major music festivals, fancy taking a trip home to see your family, or just want a weekend away, Megabus can sort you out for cheap. Explore what they’ve got to offer, look out some loose change and take yourself a trip. Easy as that.